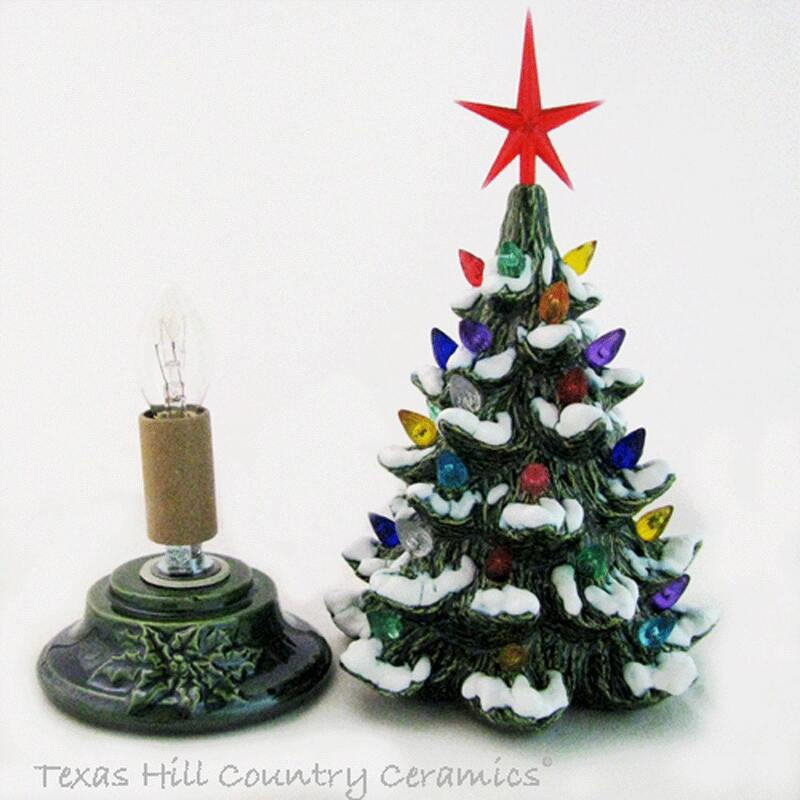 This ceramic Christmas tree with snow is sure to add a bright spot to your happy holidays. 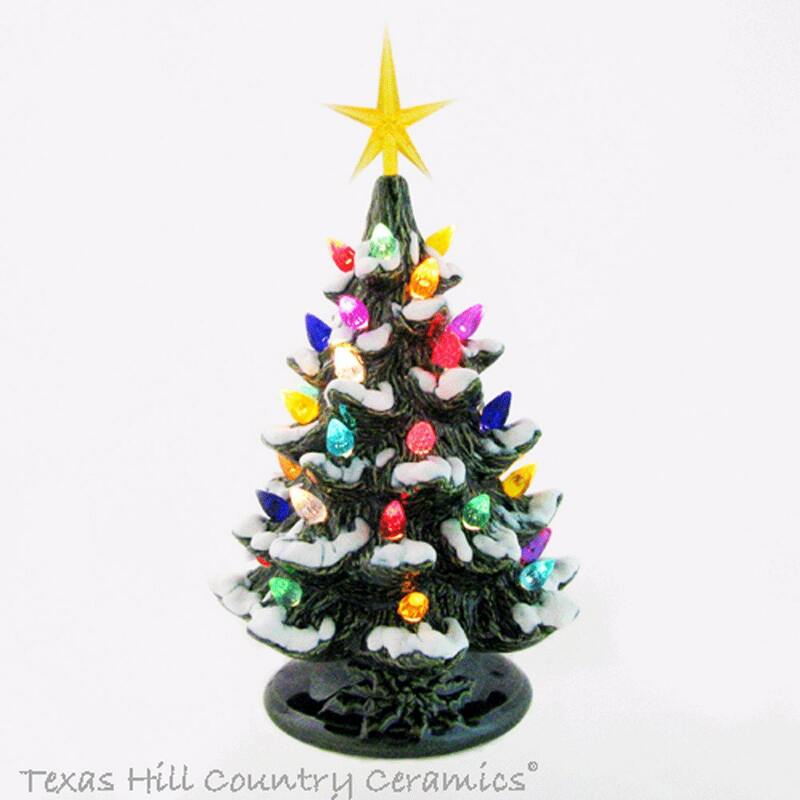 This traditional Christmas Tree is ceramic and decorated with 9 different color lights and a star. The base the tree sits on is decorated with holly that is enhanced with green art glaze. The finished height is approximately 8 1/2 inches tall. The tree section measures 5 3/4 inches tall and 4 1/2 inches wide. I chose to finish this tree with an evergreen art glaze. Art glazes are a single color glaze. When this type of glaze is fired in the kiln the glaze flows producing a lustrous finish and dual coloring, the dual coloring enhances the detail of the piece giving the appearance of a darker shade. This glaze gives the piece depth and high lights. The snow added to the branches is permanent, it is fired in the kiln so it is long lasting and will not change in color or dimension nor will it flake off over time as non-fired snows tend to do. This tree is decorated with twist style colored ornament bulbs, the lights are secured to the tree with water base glue and can easily be removed. At the top of the tree is a star, you have a choice of star colors. The base and tree are 2 separate pieces and the electrical plug and socket and rotating switch are UL approved. All bases are wired with a UL approved light fixture and plug that is standard for electrical systems used the USA. Light bulbs sent with the tree are for USA electrical systems as well. This popular style Christmas tree measures approximately 8 1/2 inches tall, including the base and star. This tree works well in small areas and would complement any room in your home, a student dorm room or office or for a family member that is a resident in a nursing home. It is so easy to set up you can even take it to work and decorate your office, reception area or cubicle and share the Christmas season with everyone. This tree will arrive ready for you to set up and enjoy. Due to each one being hand made the placement of the snow many vary slightly on the one you received from the one in the photo. All measurements are approximate. Love my purchase! Received several compliments,will buy again! So cute! I love my little tree. It came very well packaged and very quickly. I wish I would have purchased the larger one! Thank you so much, this will be a wonderful addition to my Christmas display.